One of the best things about West Michigan is the fresh goodness of locally grown fruits and vegetables. Various farm markets around the region offer a bounty of the best-tasting produce around. Shopping for fresh produce is convenient, with many of the local farm markets open from May until September or October. 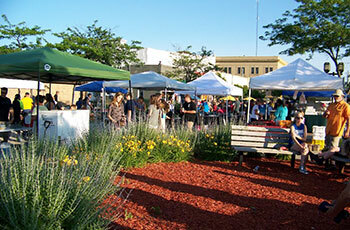 Ludington's farmers market operates from 3pm-7pm on Fridays from late May to late September. It is located at the North James Street Plaza. May 24-September 20, 2019. Pentwater has two farmers markets during the summer months, one on Mondays and one on Thursdays. Both are from 10am to 1pm on the Pentwater Village Green. Pentwater Farmers Markets run from early June to early September. June 3-September 2, 2019. Visit Hart's farmers markets from 3pm-6pm on alternating Thursdays from early June to mid-October. It is located on South State Street between Washington and Main Streets in downtown Hart. June 6-October 12, 2019. Manistee's farmers market is located on Memorial Drive and is open from 8am to 1pm Saturdays from May 25-October 5, 2019. Although the seasons are dependent upon the weather, we've listed the time periods when local crops typically are harvested. Interested in learning more about local agriculture? Read our story about the Agricultural Trail in Mason & Oceana Counties and download a brochure for more details. Asparagus starts the season in the spring, with Michigan being the third largest producer in the nation. Oceana County is actually known as the "Asparagus Capital of the World," due to its high production of this healthy crop. Also in the spring comes the maple syrup, a true American sweetener. Here in Mason County, Kistlercrest Farm on Old PM Highway produces about 1,200 gallons of syrup every year. The real thing is thinner than the brands of syrup you buy in the supermarket, but the taste is far superior. The Kistlers also make maple sugar candy, granulated maple sugar, and at Christmas, maple cream candies. As summer arrives, so does the fresh bounty of fruits and vegetables, including apples, cherries, lettuce, sweet corn, and strawberries. Local farm markets and even roadside stands sell the freshest produce, picked daily. Near the end of summer, it's blueberry time. Michigan tops the list for the most blueberries grown in the nation. Various U-picks in the area let you grab a basket and choose your own blueberries. Autumn is a wonderful time in West Michigan, with cool temperatures, trees sprouting gorgeous colors of reds, yellows, and oranges, and best of all...pumpkins! Driving through the countryside in search of the perfect pumpkin is enjoyable in itself, but once you arrive at your destination, you're in for a treat. Many farms offer corn mazes, hayrides, and pumpkin decorating, just in time for Halloween. For a list of local Farm Markets, visit our Farm Markets and U-Pick Farms page. Also read about Farm Markets in Northern Michigan.